Posted by M Bharath Bhushan in Andhra, Andhrapreneurship, ecology, Economy, Koya, Polavaram, politics, Settler, ST, submergence, TDP, TRS. Chief Minister Naveen Patnaik has urged the Prime Minister Narendra Modi not to allow construction of the Polavaram Project as it will harm the interests of Odisha as the project is being taken up without addressing the legitimate concerns of the State. Mr.Patnaik writing a letter to the Prime Minister Mr.Modi has expressed serious concern over Polavarm Project, which is being taken up unilaterally by the Government of Andhra Pradesh even the matter is pending in the Supreme Court. Chief Minister has said that the Polavaram Project does not qualify to be considered as a National Project as it does not satisfy the norms. Sadly the Union Government has considered the Polavaram as a National Project, officials say. Posted by M Bharath Bhushan in Andhra, Andhrapreneurship, Bhadrachalam, displacement, ecology, Godavari, Identity, indigenous, Koya, Polavaram, ST, submergence, TDP, Telangana, TRS. Another Salwa Judum in the making? Hyderabad: In what could be a rerun of the failed Salwa Judum campaign of Chhattisgarh, the Andhra Pradesh government, faced with a renewed threat from Maoists, is planning to raise a tribal police battalion to take on the insurgents. The cabinet sub-committee on Naxalite problem, headed by finance minister Yanamala Ramakrishnudu, has recommended a tribal battalion, staffed by tribal youth from East Godavari, Visakhapatnam, Vizianagaram and Srikakulam, exclusively to counter Maoist insurgence on the Andhra-Odisha-Chhattisgarh border. Plans are afoot to locate the battalion either at Rampachodavaram in East Godavari or Paderu in Visakhapatnam district. While the government says the decision is aimed at discouraging angry tribal youth, many of who would be dislocated due to the Polavaram project, from joining the Maoist fold, security experts feel the move is likely to backfire. Posted by M Bharath Bhushan in Andhrapreneurship, cinema, Hyderabad, Mulki, Rangareddy, Settler, Telangana, TRS. 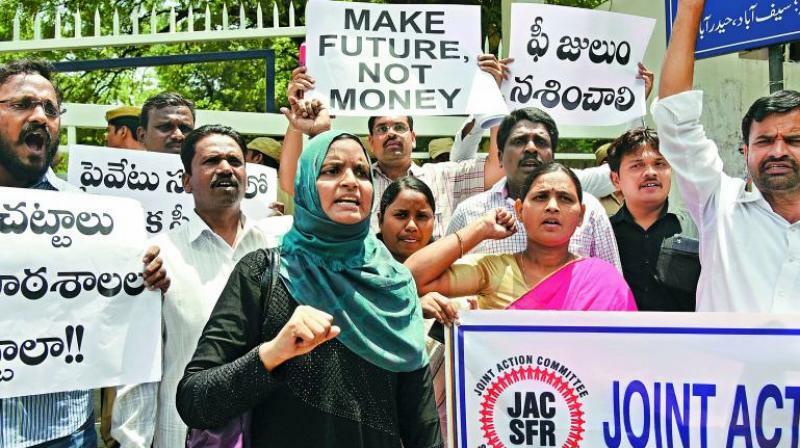 Hyderabad: The TRS government is being given a hard time by its ally MIM over its regularisation scheme. The government’s much touted land regularisation plan in Hyderabad and Ranga Reddy district has hit a roadblock with the MIM questioning the rationale in trying to rake up thousands of crores through regularisation of small plots and lands while promising huge tracts of lands for various “cities” for a song. Sources told this newspaper that Chief Minister K. Chandrasekhar Rao is quite upset with the MIM’s objections and is trying to sort out the issue with the party’s leadership.